The team of professionals at Capra & Cavelli possesses a depth of experience unparalleled in Austin men’s fashion. Our commitment to delivering the highest level of personalized service never wavers. Nor does our belief in the importance of customer relationships. We’re from Austin and we know what it takes to look good here. Kenneth has been with Capra & Cavelli from the beginning. Orginally, from New York City, Ken has worked in the men’s clothing business and custom for most of his adult life. Ken enjoys photography, video editing and motion graphics. Buddy has over a twenty years of experience in custom clothing, and owned his own retail shops in Austin and Midland. He has a proven ability in wardrobe creation and prides himself on exceptional client care. Buddy and his wife have a son at Texas A&M University. Buddy enjoys wakeboarding, motocross, auto sports, snow skiing, and family related activity. One of Buddy’s passions is serving clients via “One on One” appointments in the comfort of their home or office. Originally from Croatia, Ivan has had a lifelong passion for classic menswear, most recently working at Nordstrom’s. He came to Austin in 2010 by way of Minnesota and New York City, and had a 20 year career as a record producer and musician. He still enjoys playing music and spending time with friends, family, his girlfriend and her dog Harley. 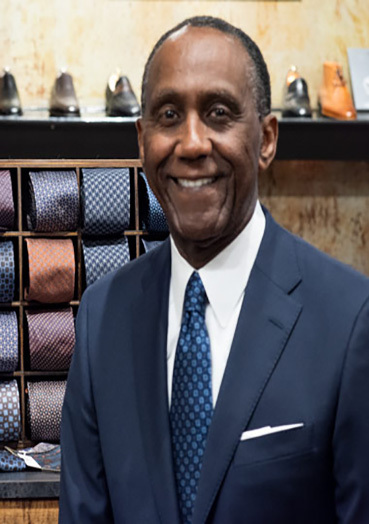 Anthony brings nearly a decade’s worth of experience to Capra & Cavelli, and was recently employed by the New Orleans’ iconic menswear shop, Rubensteins. Anthony has a passion for custom clothing, styling, and wardrobing. He enjoys mixing elements of modern fashion and classic style to create outfits that are trendy yet timeless. When he’s not at the store, Anthony can be found playing drums with his band, Blonde Roses; relaxing with his wife and dog, and traveling. "I was given solid service and even offered a beer while I shopped. Rene was great." - Rob D.
“Heard they have a great reputation, and now I know why: amazing service and attention to detail. Ivan was exceptional. This is our new first stop." - Stuart F.
“Buddy helped us pick out a nice custom suit. Not only is he so patient and easy to work with, he's also very knowledgeable and listens to his clients' needs. Quality service like that can't go unnoticed." - Mary L.
"What can I say. Quality merchandise, friendly and courteous - extremely professional - just a great place to shop. Kenneth is the best, he is non pushy and extremely helpful." - Joseph B. "Buddy helped pick out everything and get the absolute perfect fit. I cannot recommend this place enough. Do yourself a favor and go to the best of the best when it matters. C&C is a true gem." - Kelly K.
"Let me tell you this everybody, Buddy knows his suits. He is one of those rare salesmen, that actually love what they do and it shows." - Ryan M.
"I would definitely recommend C&C for their selection, and Buddy Estrella as the best damn clothier I've had the pleasure of working with." - Brandon T.
"Kenneth was outstanding, right suit, right price, properly marked and then tailored." - Mark M.
"Their prices are competitive, quality is top, and Kenneth's expertise, taste, and customer service is superb." - Dio M.
"A wonderful boutique clothing store that had a wide variety of clothing and was well stocked. Sandy was an amazing resource and we stopped in twice during our stay to shop." - Mary G.
"Kenneth is pleasant and fun to work with and never acts like he's doing me a favor though he has graciously done many favors for me. That's his personality. My experience with Capra and Cavelli is as good as it gets." - Gay T.
"Ken listened to my thoughts, provided some insight, and we worked together to make decisions. I look forward to stopping by more often. I also found the other employees to be extremely helpful and it appeared the other customers were having a similar experience." - Justin W.
"I was blown away at what a gentleman Ken is and how knowledgeable he is with everything regarding men's clothing. It was great to see how a perfectly fitting suit can boost a man's confidence." - Caroline M.
"Buddy is extremely attentive and genuinely cares about providing exceptional service, and of course, also knows his fashion. He also spends the time to get to know you personally so that he can provide the best service possible." - Jeffrey S.
"LOVE LOVE LOVE this place. You can find the cutest shoes, clothing, and gifts! What really sets them apart is the customer service!" - Vanessa Y.